Dave Gorman is an English comedian, author and television presenter. Dave Gorman has performed comedy shows on stage in which he tells stories of his extreme adventures and presents the evidence to the audience in order to prove to them that they are true. He was a stand-up comedian before he became famous for Are You Dave Gorman? David Gorman is an English author, stand-up comedian and presenter. He has performed comedy shows on stage in which he tells stories of extreme adventures and presents the evidence to the audience in order to prove to them that they are true stories. 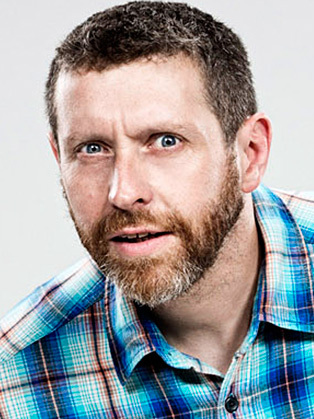 He was a stand-up comedian before he became famous for Are You Dave Gorman?, then took a break from normal stand-up. He returned to stand-up in 2009 with a show called 'Sit Down, Pedal, Pedal, Stop and Stand Up' whose unique feature was that he cycled 1,563 miles from the southernmost point of Great Britain to the easternmost to the westernmost and then to the northernmost with a gig following each night. Dave is in demand as a writer, having co-written three series of The Mrs Merton Show, as well as writing for many other TV series in the UK, including The Fast Show. His other writing credits include Jenny Eclair, Harry Hill and Steve Coogan. In 2003, he was listed in The Observer as one of the 50 funniest acts in British comedy. Dave also regularly appears on the BBC Three show, Rob Brydon's Annually Retentive, a comedy show hosted by Rob Brydon with Dave as one of the show's team captains. In 2006 he became an occasional contributor on Comedy Central's The Daily Show with Jon Stewart. He also hosts his own radio series, Genius, and his documentary feature, America Unchained, was shown on More4 in February 2008. The book of the series was published in April 2008. More recently, Dave has had the third series of his critically acclaimed television show “Dave Gorman’s Modern Life is Goodish” commissioned. Using his trademark blend of stand-up and documentary comedy, Dave flips open his laptop once again and fires up his PowerPoint to share more wry observations and frustrations.